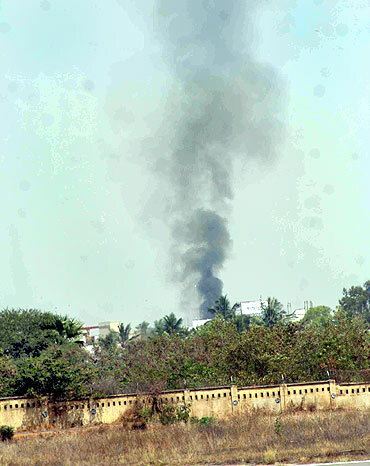 Two pilots and a civilian were killed after a naval aircraft crashed on a nearby residential building near Begumpet airport during an air show in Hyderabad on Wednesday morning, city police said. Seven others were also injured in the mishap, the police added. 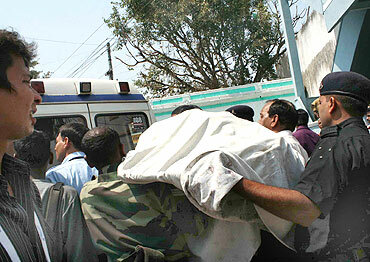 The pilots were identified as Commander S K Maurya and Lt Commander Rahul Nair, a navy spokesman said in New Delhi. Lt Commander Nair belongs to Delhi, he added. 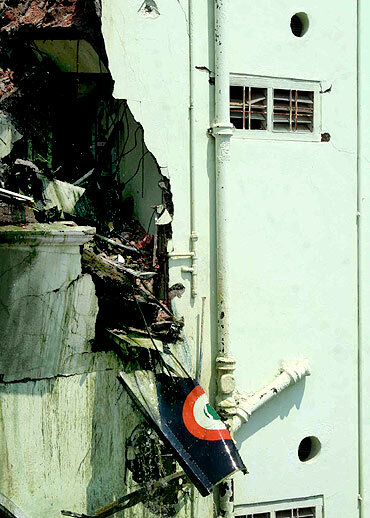 The Kiran MK-II plane, which was part of the 'Sagar Pawan' aerobatic team participating in a display at the India aviation show, crashed into a three-storey building, Hyderabad Police Commissioner A K Khan said. "So far one building is damaged. 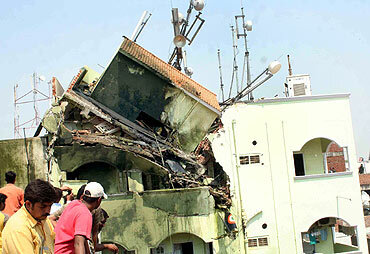 We have to see how many people were inside it..," he said. Navy chief Nirmal Verma, who was in Bhopal, said the pilots had not ejected from the plane. "So the possibility is either timewise there was a problem or they (the pilots) were making all efforts to ensure that damage is minimised to any civil area. They are no more," he said. "The inputs that I have got is that about seven people are injured," he said, adding, "I have to wait for more information. It is premature for me to say what could have caused the crash at this stage." Black smoke billowed from the building after the crash and firemen were seen at work. Fuel could also be seen dripping from the mangled remains of the aircraft. The police, which reached the crash site, kept at bay a large crowd of onlookers which had gathered there and put a cordon around the area. One vehicle parked outside the building into which the plane went down was also damaged. Khan said that the injured have been sent to a hospital. The cause of the crash is being ascertained, official sources said. 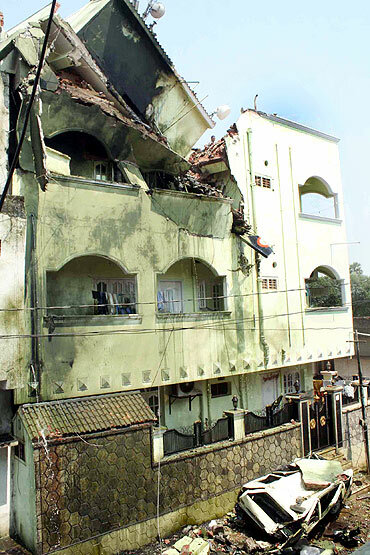 The plane, which was part of a formation of four aircraft, crashed into a three-storeyed building at Bowenpally area near Begumpet airport where the airshow was on. 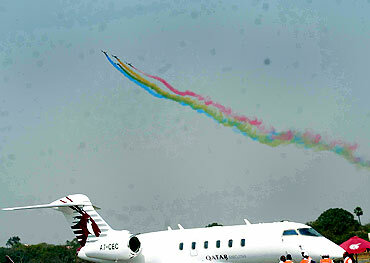 Formed in 2003, the Sagar Pawan team had last performed at the MiG 29K induction ceremony in Goa on February 19. It is one of the only two naval aerobatic teams in the world along with the 'Blue Angels' of the American Navy and uses four Kiran Mk-II trainer aircraft based at the Indian Naval Air Station Hansa in Goa. 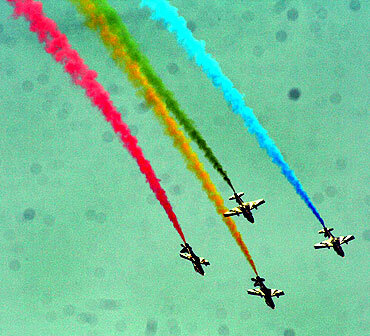 In a span of three days, this is the second mishap involving the aerobatic display teams of the Indian armed forces. On February 27, an ALH Dhruv of Indian Air Force's Sarang helicopter display team crashlanded in Jaisalmer due to loss of power while rehearsing for the Vayu Shakti air show there. A pilot of IAF's Suryakiran Aerial Display Team, which also flies the Kiran Mk-II aircraft, had met with an accident on January 21, 2009, killing the pilot. Another Surya Kiran aircraft crashed on March 18, 2006, near its home base at Bidar in Karnataka during a training sortie, killing Wing Commander Dheeraj Bhatia and Squadron Leader Shailender Singh. In 2010, the IAF has lost two fighter aircraft -- a MiG-27 and a MiG-21. Last year, the IAF had recorded 11 air mishaps, of which five involved MiG-21 aircraft.